Looking for a good side to go with your meal? I made Paula Deen's Spinach Stuffed Zucchini the other day and it was delicious. 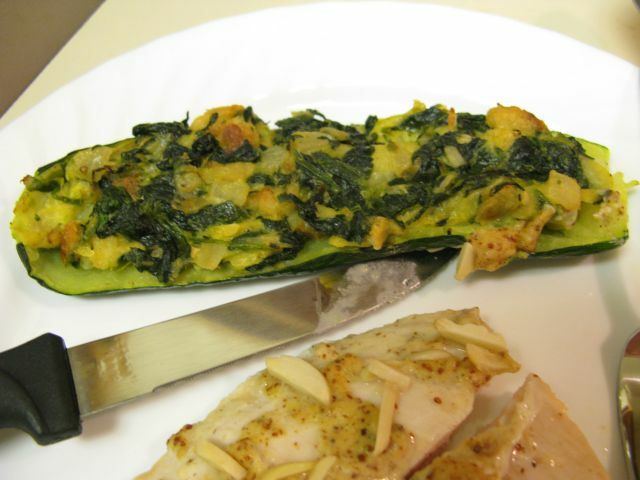 I used zucchini instead of yellow squash, but I think they are interchangeable. The zucchini was a little hard for me to get out of the skin, but I think a grapefruit spoon or some spoon with edges would make the task a whole lot easier (to bad I don't have any now that I don't live with Kristina!). It's easy to make, the only downfall is that the steps take a while. I also halved the recipe because it yielded to much for just Eric and me. Hope you enjoy!